New technology at Boston Children’s Hospital allows doctors to track several monitors providing data on a patient on a single display. Most patients in the cardiac intensive care unit at Boston Children’s Hospital are recovering from heart surgery. At any moment, their blood pressure could plummet, their tiny hearts stop beating. The doctors there have struggled to predict which child was likely to take a sudden turn for the worse. They had to choose from among a half-dozen monitors for the most revealing information. And after a crisis, they could not look back at patient data­ to see what might have led to it, said Dr. Melvin C. Almodovar, the unit’s medical director. So Almodovar and his colleague Dr. Peter Laussen recently created a software system to address those problems and make care more proactive. Launched as a pilot project last summer, it has been helping Children’s doctors and nurses get a better handle on what’s going on with patients in cardiac and medical-surgical intensive care. The system — dubbed T3 for tracking, trajectory assessment, and triggering decisions — continuously collects and integrates information from different machines to provide a more complete sense of what is going on with a patient. Last week, technicians began installing the same software program in Toronto. With T3, devices monitoring oxygen delivery to the brain, breathing machines, and drug-delivery pumps are integrated with heart rate and blood pressure measurements. Instead of looking at multiple monitors, the doctor or nurse can get all the crucial information on one. The data are stored and can be pulled up in real time or later by any computer or tablet that is connected to the Children’s network. Having that data readily available makes it easier to review a patient’s path over time, Almodovar said, and for a doctor or nurse to pass care off at the end of a shift without missing crucial information. The doctors are even using T3 to develop a single metric, a composite of all the underlying data that will serve as a “stability index,” and provide a metaphoric flashing red light when a patient is in imminent danger. Nearly every patient in the hospital’s intensive care unit — newborns, young children, and even adults — was born with a heart defect, and most are either ready for or recovering from heart surgery. Some patients are so tiny they are barely visible amidst a small bundle of blankets, dwarfed by their child-size beds and the colorful balloons floating overhead. Anxious parents try to act lighthearted for older children, against a backdrop of machines and devices that continuously emit beeps and readings. Laussen left Children’s last fall and is launching the T3 system at his new unit at the Hospital for Sick Children in Toronto within a few weeks, the first time it will be used outside of Boston. Just last week the system at the Toronto hospital began tracking patient data, the first step in a phased implementation. Laussen said T3 grew out of his frustration with the current standard of care. 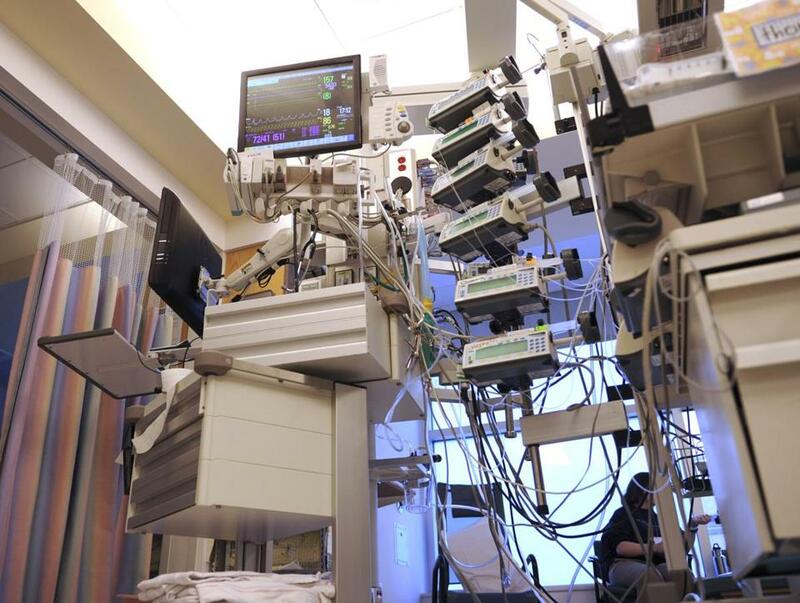 Information produced in intensive care units has gotten more detailed and useful, he said, but there is so much of it that caregivers are often overwhelmed. Each measurement is recorded by devices made by different companies that do not talk each other. A doctor focusing on blood pressure data might miss important information coming from the oxygen monitor and vice versa, he said. Nor do these devices have much memory; data that a caregiver cannot remember or does not catch are lost forever. A slow increase in heart rate over hours would have been almost impossible to catch, he said, because of this lack of integration. That meant doctors have mainly been reacting to crises, rather than predicting them, Laussen said. Capturing the data­ with T3 lets caregivers see issues developing over time, so “we can move from prescriptive to predictive,” Laussen said. Doctors can access the T3 system from home, he said, so they can keep track of patients remotely, or better understand changes that are flagged by someone on duty. “The nurse or physician at the bedside needs to be able to interpret change,” Laussen said. “If they call someone [for advice], they have to explain what they’re seeing. That can be hard to communicate. Some people can do that effectively, other people don’t listen very well, and they may question what people are seeing and trying to interpret.” T3 helps to avoid such confusions and conflict. So far, T3 has captured more than 2 billion observations, said Michael Gleeson, senior vice president of product strategy at the Burlington-based health care information technology company Arcadia Solutions, which designed the T3 system. The biggest technical challenge, Gleeson said, was getting the data from different monitors to stream continuously, in near-real time. Other children’s hospitals are considering installing T3, including Children’s National Medical Center in Washington, D.C., and Lucile Packard Children’s Hospital at Stanford University in California, Laussen said. Dr. Andrew Y. Shin, associate section chief of cardiovascular intensive care at Lucile Packard, said medicine has traditionally lagged other sectors in using giant data sets to make better decisions. He plans visits to both Boston and Toronto during the next few weeks to watch T3 in action and figure out how to best implement it at his hospital. Boston Children’s owns the license on the technology and is charging other hospitals an installation fee, but not much more, Almodovar said, because it hopes to encourage sharing of data between institutions. For example, Boston Children’s might see an obscure problem once or twice a year — too few instances to learn much from it. But if hospitals pool their data, Shin said, it will vastly improve the educational potential.